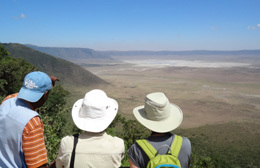 View into the Ngorongoro Crater Exceptional game viewing and exhilarating wilderness trekking in a range of spectacular African landscapes and environments. Drive from Arusha to Ngorongoro to our base at Rhino Lodge, where an afternoon walk in the Crater Highlands (with an armed ranger) can be arranged. Run by the Maasai here, and located in the Crater forest, it's normal for zebra, buffalo and even elephant to be grazing right outside your window (en-suite rooms). 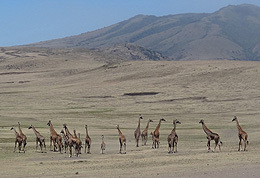 Concentrated wildlife on the Crater floor Often described as the eighth wonder of the world Ngorongoro is a collapsed volcano, creating a 25km diameter crater floor teeming with Africas famous big game and offers an excellent chance of spotting the rare black rhino. We have the full day's permitted game drive here, with picnic lunch by the lake before return for late afternoon and overnight Rhino Lodge. Short drive to the Ranger's Post at Nainokanoka. 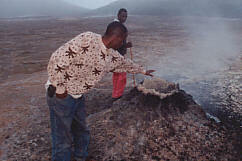 Set up camp and hike up to the Olmoti Crater with an armed Ranger in the afternoon. 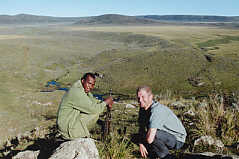 Its around an hour to the rim and another 2 or 3 hours to descend to the Munge waterfall and return to camp. 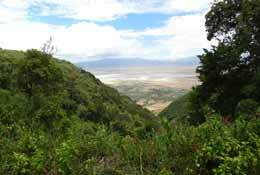 This waterfall is the source of the Ngorongoro Craters lake. Camp overnight. 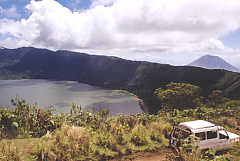 Drive (3 hours) and/or hike (8 hours) to Empakaai Crater. 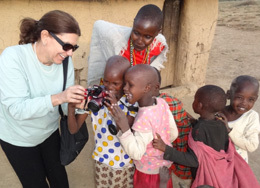 Journey accross the Embulbul depression through high rolling grasslands dotted with Maasai herds and occasional villages with bemused children watching you pass. There's a lot of wildlife here too, though warier than in the more visited areas, and all the while Mt Loolmalassin looms over you in the east. Looking down to Empakaai Crater Lake Steep descent into Empakaai Crater for exploration of the flamingo fringed soda lake in its floor. Very few people do this and it really is quite a remote world down there. Return to camp on rim for overnight. Forest route to the Rift Valley floor Trek for about 7 hours down the great escarpment on an ancient footpath through the virgin forest to Engaruka in the Rift Valley, getting warmer all the way as you descend. Meet the vehicle and cook (they drive back around to set up camp). Cool, refreshing, sparkling clear spring to bathe in after the trek. Camp overnight. Exploration of ruins of mystery civilisation. Between 5-800 years ago people were building irrigation systems, stone houses and terraced fields here - remarkable if not unique for this period of African history. Our visit supports the local primary school and conservation of the ruins here. Return to Arusha. 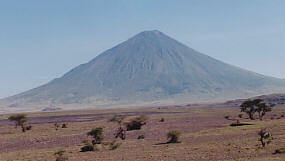 Ol Donyo Lengai - the Maasai's mountain of God After exploration of the Engaruka ruins in the morning, drive to campsite near the foot of Mt Lengai - about 3 hours along a bumpy dusty road. Camp in well appointed site near escarpment spring for cooling dips. Active vents on Lengai's crater A 2am start, spectacular and eerie in the starlight, for a long, steep and very tricky climb on sharp volcanic lavas and slippery ash. Only trekkers who are confident of their abilities should attempt this. If you're fit it will take 4 hours up and 2-3 hours down again. Allowing 5-6 hours up and 3-4 down would be sensible. Descent to the active crater floor is possible but potentially dangerous - it is an active volcano - (an eruption in April 2006 prevented all climbing for a year). Return to Arusha for late afternoon. Accommodation is in a lodge and camping (fully supported) at various Ngorongoro Conservation Area and permanent camp sites. All your equipment will be carried by vehicles or local porters, you only carry a day-pack with personal gear. When camping you will not have to participate in camp chores. We buy fresh produce locally and to ensure good standards of hygiene all food is prepared by our own staff. We can cater for special dietary requirements and there are no extra food-kitty payments. Transport - 4WD Toyota Landcruisers with roof-hatch for game viewing. All camping equipment on the two nights required - mattress, pillow, sleeping-bag with cotton liner.